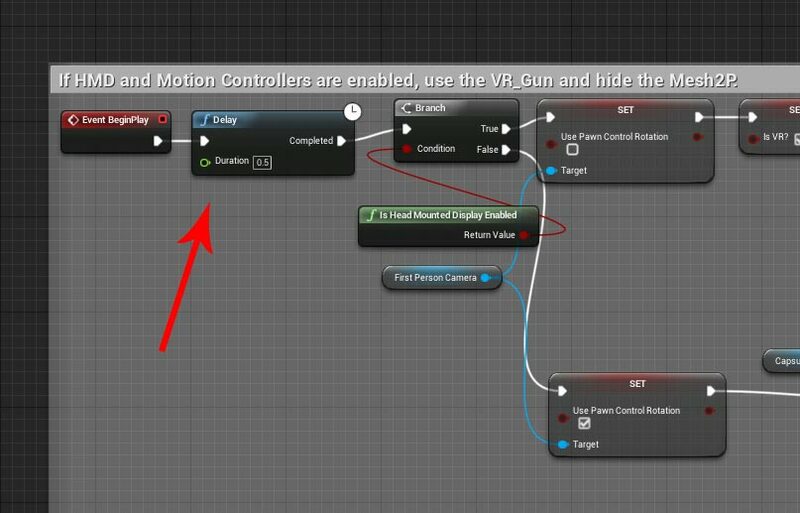 Been stuck trying to figure out why #VR code in #UnrealEngine runs fine in the editor but not in a packaged build. It turns out when packaged, the "Is Head Mounted Display Enabled?" function will not actually detect the headset until half a second or so after the game starts. Janky way to fix this for now is to delay all VR code by a half second, but my worry is that this will vary depending on the computer we're running on. Oh and for those who can't get even get the game to run in VR mode at all in the packaged game, you have to check "Start in VR" in the project settings. This will still start in non-VR if no headset is connected, so it's annoying this isn't just a default option to begin with. Tried to sign on to my remote workstation this morning only to get some error about "CredSSP encryption oracle mediation." It turns out my laptop installed Windows Updates overnight. The below updates are what you'll want to uninstall and then restart to be able to use RDP again. They're basically updates installed on 2018-05-09. It looks like the issue is that both server and client need the updates installed to be able to connect (in other words, no backwards/legacy support). Will be holding off on these updates until Microsoft fixes the compatibility issues, as I'm not inclined to install anything that might accidentally lock me out of my servers. 2. Browse to Computer Configuration / Administrative Templates / System / Credentials Delegation in the left pane. 3. Change the Encryption Oracle Remediation policy to Enabled, and Protection Level to Vulnerable. It seems I can't get a dinner anymore without overhearing talk about blockchain. One point I keep hearing that irks me though is that government wouldn't restrict the crypto industry because of how much money they could make by letting it flourish. That is just wrong on so many levels. Whether a law exists or not has nothing to do with making money. It doesn't matter if everyone got paid or the government gets a cut. Otherwise by that logic, you might as well say the government should let drug trafficking and black markets flourish because of "how much money they could make." It's like if a cop let someone go for stealing because the cop got a share. As long as everyone gets a piece, what's the harm? Unfortunately this kind of thinking seems to be the norm in crypto and really just finance in general, where right or wrong is decided solely by whether money is made.